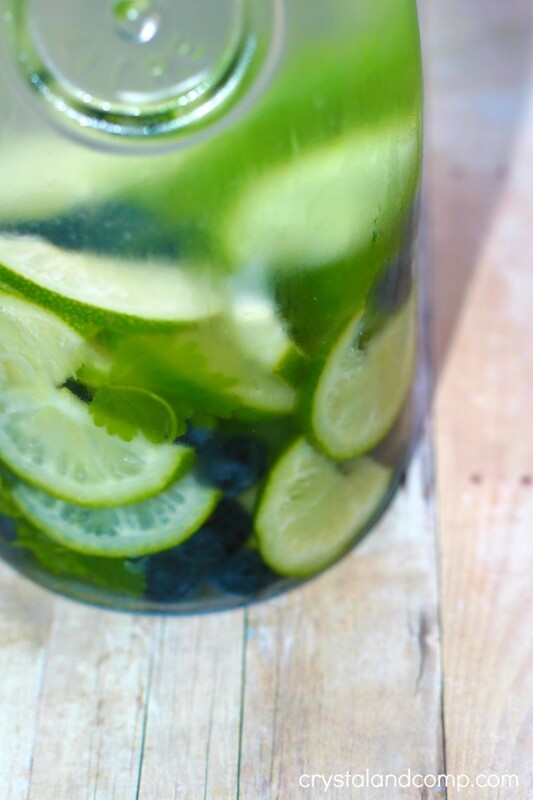 One of my friends recently asked if I could find some good infused water recipes. 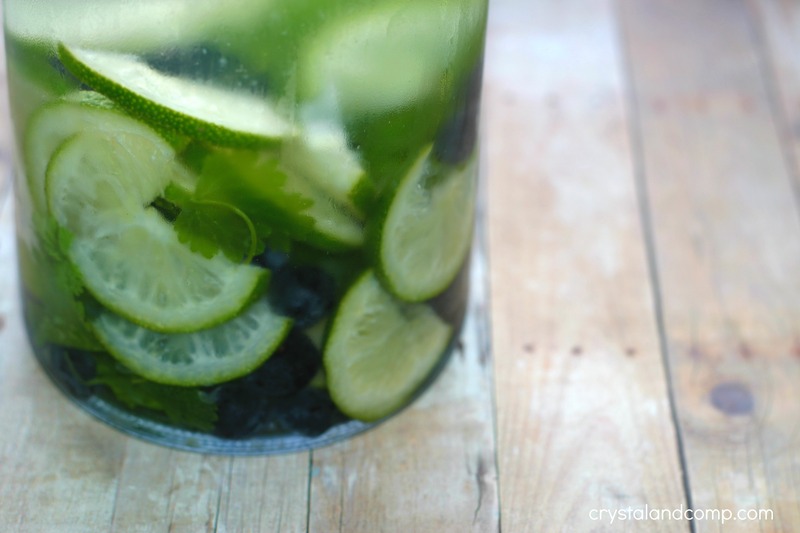 I have never tried making my own infused water, unless adding lemons to your water counts. I started searching online for some good fruit infused water recipes. I really just found the same ones over and over again. I plan to pull together some great roundups of these water recipes as I have more time to research them, but in the meantime I decided to try some of my own. I asked my friend what pairs well with cilantro. It was the only herb that looked good at the store the day I went to get supplies. Her response: blueberries, lime and cilantro. So here is how you make it. This is not a sweet drink- more of a savory water, if that is possible. When I told the kids I was making infused water, my little Nicky said, “Confused water?”. Love that kid! Add the blueberries, lime and cilantro to the pitcher. I like this carafe because it comes with a plastic lid to cover the top while it is in the fridge. I grabbed my carafe at Target for like $5. Pop it in the fridge for 4 hours or so. The longer you leave it in there the more the flavors will infuse together. As it sits the cilantro will start to fall to the bottom. I like to give the carafe a good shake to mix up the flavors before I pour a glass. 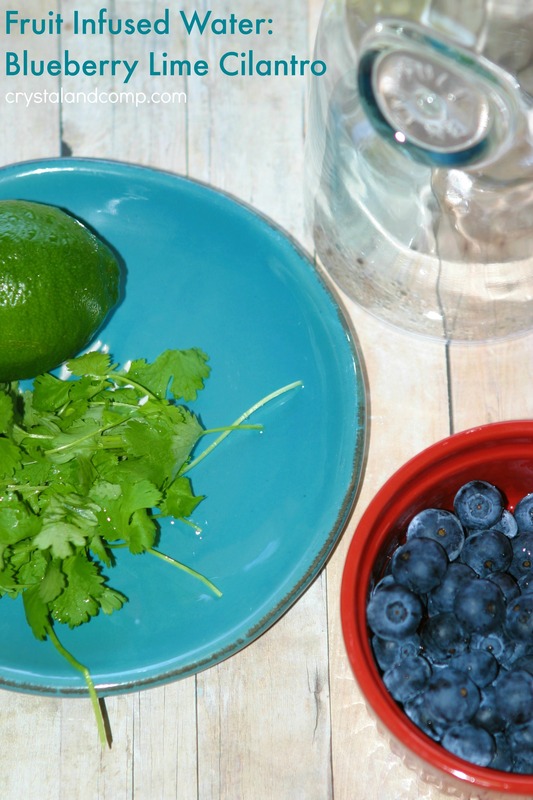 Pour your glass and let a couple of berries, a lime slice and a few sprigs of cilantro fall into your glass. This will keep in the fridge for a few days. I don’t know that I would drink it past 5 days or so because I image the fruits start to ferment. 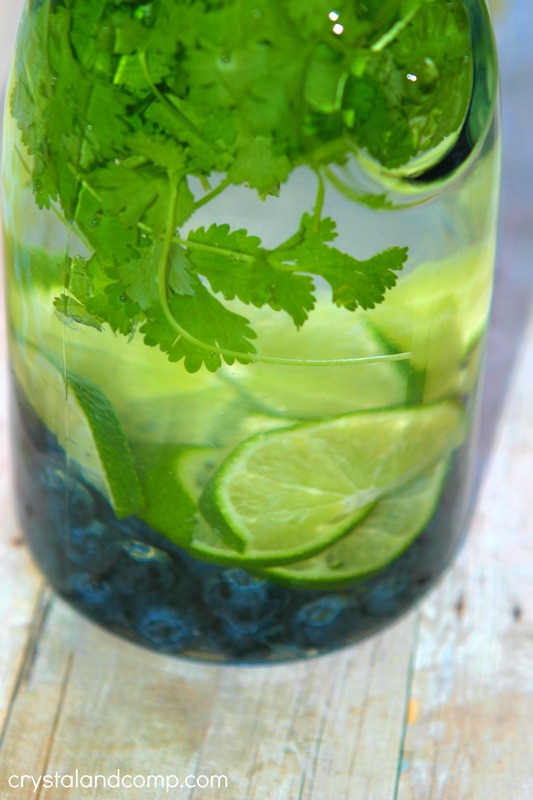 If you drink the liter of water fast enough, add more water to the bottle and start the process over using berries and cilantro that are still in the bottle. Super easy and it is a great way to get your daily water if you struggle with water being boring. What are your favorite fruits, veggies or herbs to add to your water? I recently purchased cilantro for another recipe and had some left. I didn’t want to throw it away so I’m so happy that you posted this recipe. I love flavored water so I’m looking forward to having this water this evening. Thanks!